HAPPY HEN is designed for all types of poultry it contains a mixture of premium whole and crushed grain including peas, barley, wheat and maize with no unnecessary additives. Categories: FEED GRAINS, Grain, Mixed. HAPPY HEN provides laying hens energy and some protein and fibre, hens need energy from the grain to gather and process food, keep warm and above all make eggs. 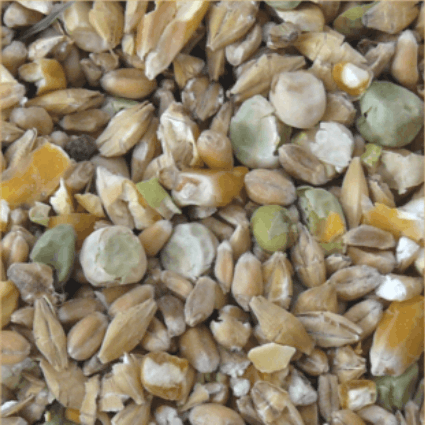 Grain also promotes an active gizzard, the gizzard is an important part of the hens stomach system. It is designed to grind-up hard feeds like seed and grain, an active gizzard is an important part of the hens overall health and wellbeing. Key Benefits: For many years poultry enthusiasts have informed us that their hens lay bigger more wholesome eggs when Happy Hen is included in a free choice feeding situation. Free choice feeding means hens can use their senses to identify food and make there own nutritional choices. This is different to feeds determined by the manufacture like pellets where various compounds are blended and cooked or grains that are un-necessarily coated in molasses. 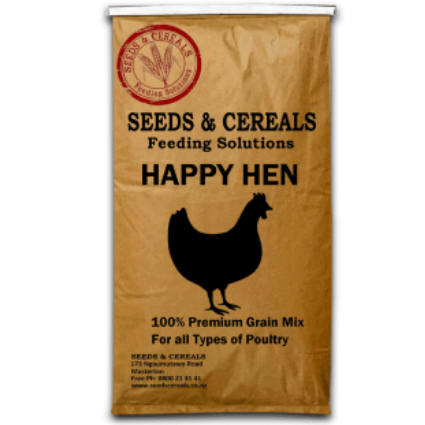 Happy Hen is a pure quality grain mix, that is best fed alongside other identifiable sources of protein, calcium and minerals some available on our website are Meat & Bone Meal as a source of protein, Oyster Grit as a source of calcium and Seaweed Meal as a source of trace elements. Feeding Rate: The average amount of Happy Hen consumed by a hen per day is 130g (Ensure poultry have access to fresh water at all times). 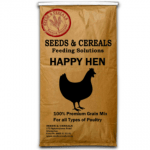 Nutritional Information: Happy Hen contains a premium mix of whole and crushed grain including peas, barley, maize and wheat with no unnecessary additives.